The year 2016 marked the 20th year in the history of SAP TechEd. Back then, when it all started, who would have thought that one day there will be a billion connected physical devices and we will be making sense of the enormous amount of data these devices transfer persistently. That was the time when people hadn’t even heard of Google, forget IoT, the fancy term coined by Kevin Ashton in 1999. This was my first experience as an Attendee as well as Presenter in a technical event of such stature and I must say that I was completely blown by the amount of enthusiasm people showed at the event. It began with the SAP Executive Keynote by Bernd Leukert who mentioned about the volumes of digital data generated by numerous sources like traditional ERP systems, sensors, social media, satellites, streaming, pictures, films, etc. which is around thousands of Exabyte and makes it impossible for a human being to make sense out of it. He distinctively emphasized on the importance of making meaningful insights from such data sources in real time to help the customers and industry. Next, he introduced the SAP HANA Express Edition, which is a streamlined version of SAP HANA that can run on laptops and other resource-constrained hosts, such as a cloud-hosted virtual machine, for free up to 32G of memory use. Covering few other topics related to Artificial Intelligence, Machine Learning and Big Data, Bernd wrapped up the keynote by showcasing a small demo on how SAP IoT connects the World to enable live business. Attendees started diffusing over the demo pod areas and the lecture halls with pens, pads and an open mind hungry for knowledge. Each demo pod housed around 12-15 people when the sessions started. A number of IoT pods where showcasing scenarios with sensors engaging in transferring data continuously that was consumed by the application, processed and meaningful insights were drawn onto the presentation layer. A lot of applications presented this data geographically which showed the location of such devices in a map and its relevant information with it. SAP Digital Board room, SAP Connected Goods and few iOS based Fiori apps exhibited similar presentation of maps. I, along with few colleagues from my team, Former Member, Former Member, Former Member and PVN PavanKumar were engaged for a majority of the time during the first 2 days by the IoT Edge Processing, Live Business with IoT and the Smart Vending Machine demos. 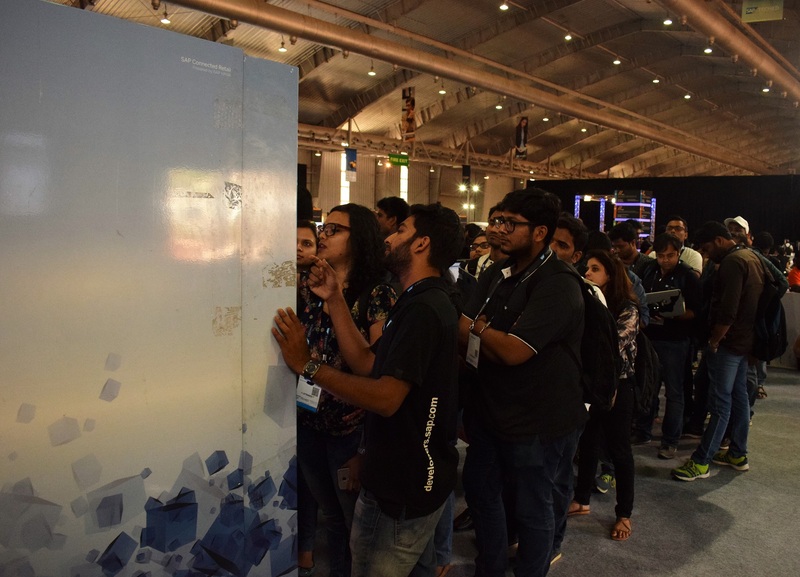 It was the first TechEd experience for majority of us and we were extremely thrilled by the oohs and aahs of a number of attendees, who had some really stimulating questions as well. I remember someone asking “Is there a possibility that different devices which have some relation in the real world can be connected irrespective of the type and can communicate with each other?” We still do not have pragmatic models to explain such scenarios, but this just encourages us to work towards achieving answers to similar questions. Adapting to a SAP-Fiori way of designing and developing user interfaces is something that is being focused on these days and I saw a number of pods that were showcasing the fiori framework, user experience, design patterns, and new components that have come up in the last couple of years. Using these guidelines and this framework makes the life of a developer extremely easier, since it reduces the work required to implement UI5 components for same purposes. This user experience of fiori has also reached iOS recently. Apple and SAP have partnered this year to revolutionize the mobile work experience and drive innovation for companies of all sizes. I saw a small demo where a fiori based iOS app was seamlessly integrated to other iOS apps like Facetime and Apple touch ID, which gave a whole new experience. 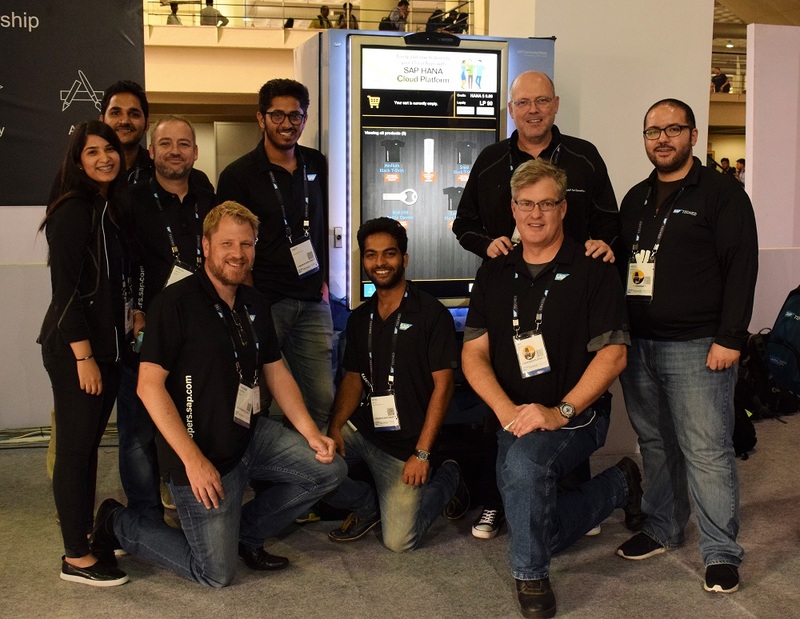 Apart from the demo sessions, there were hands-on sessions to give an experience of developing simple fiori apps along with the use of a version control software. I am sure everyone enjoyed pulling, merging and committing their changes to Github. Another interesting session I attended revolved around Continuous Integration, which had more to do with the development paradigm that is followed across different companies. Usually, a number of developers work on the same product and develop their changes individually, due to which the system is prone to integration issues which cannot be detected before everyone merges their code in. With Continuous Integration, risks like these reduce a lot and elevates the confidence level too. Looking at the industry demands and constantly increasing expertise level of coders, CI is the way to go in the coming future, but at the same time it requires a huge mindset change. There was one region which was jam-packed for all three days at the TechEd. I am pretty confident that almost everyone came to the App Space to witness the Smart Vending Machine and complete a 10-tutorial challenge to vend gifts from the giant machine. The challenge included basic programming based questionnaire on HCP, HANA, IoT and SAPUI5. The number of submissions at the end of 3 days were 4,957 which was more than 2.5 times the count at Las Vegas. I must say Craig Cmehil and his team put up a tremendous show and being closely involved with the Smart Vending Machine, I am proud to be part of such a technology. How could we forget the innovative applications built by the InnoJam finalists who were not only able to come up with solutions to the problem statement but also coded in 36 hours to conceive and build real, working prototype for this year’s focus, Education and Research, using specific SAP technologies. This was followed by a riveting performance by Neeraj Shridhar who called up few people on stage to dance with him while singing his favorite melodies. All demos, lectures, speaker sessions, hands-on sessions were a brilliant example of how the IoT revolution has hit SAP and still it makes the sophisticated technology run in a simple way leaving the complications behind.